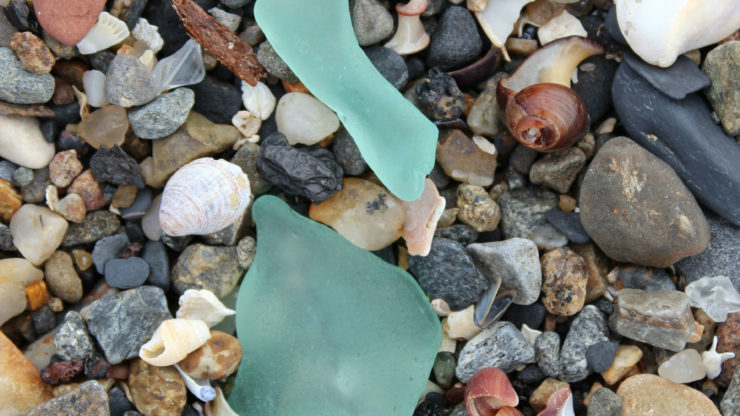 Many of the first sea glass shards I discovered were the soft green hues of the once common Coca Cola bottle. The color is still one of my favorites because of its soft, subtle look and its resemblance to the sometimes greenish tinge of ocean waves on a cloudy day. The early Coca Cola bottle with its unique contour shape and raised vertical lines and letters was designed so that it could be identified by its feel, even in the dark! The green color and distinctive bottle shape was first introduced by the company in 1915. At the time the company called the color German green, but sea glass lovers long ago renamed the shards from this mass produced glass bottle “sea foam green,” a term that is more descriptive. Also interesting to note is that the early Coca Cola bottles were heavy, weighing in at a whopping 14.5 oz while empty! I guess that’s why sea foam sea glass from one of the original style bottles is so thick and chunky!